This range is designed to suit a large number of types and scales of models. Available sizes range from 25mm (1 in) diameter to 76mm (3 in) diameter. Standard Propeller range is available in 2, 3 and 4 blade configurations. Options include a wide range of diameters and thread sizes including left and right hand systems. 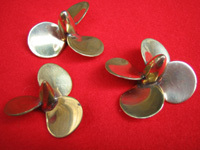 Naval Type Propellers are typically fitted to most WWII warships. Naval Type Propeller range is available in 3 and 4 blade configurations. Options include a wide range of diameters and thread sizes including left and right hand systems. 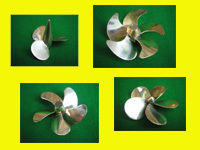 This is a more modern style high performance propeller suitable for warships or merchant ships. Type M Propeller range is available in 3, 4 and 5 blade configurations. Options include a wide range of diameters and thread sizes including left and right hand systems. 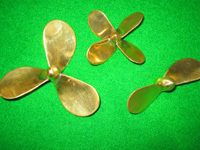 Type M propellers are also available in standard and long bosses for the range. This is a specialist style high performance propeller suitable for specialist or merchant ships with high efficiencies, manoeuvrability and positioning requirements. Thrusters include Kort Propellers and Knozzles in a range of configurations. Kort Propeller range is available in 3 and 4 blade configurations. Options include a wide range of diameters and thread sizes including left and right hand systems. This is a bespoke section for unique special items. This section is devoted to products I have available not in my normal categories. They are only available on a first come first served basis and will not be repeated. 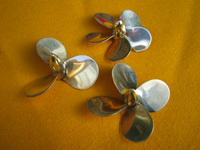 In this section you might find products with old style (BA) thread profiles and unique styles of propellers for those who are absolute perfectionists to detail.